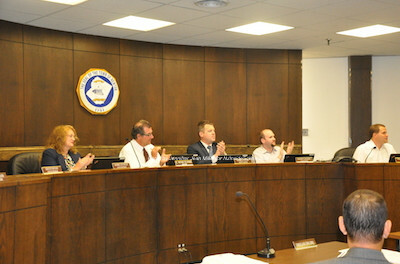 The Newton Town Council during the meeting on June 22. Photo by Jennifer Jean Miller. NEWTON, NJ – The topic of decency standards within the Town of Newton was part of an engaging discussion between members of the town council, business owners and members of the community at the Town of Newton Town Council meeting on Monday, June 22. The topic focuses around regulated conduct of those on the town’s public streets and sidewalks and the mandates that they wear shirts covering the breast and pectoral areas, that their waistbands of their clothing not drop more than three inches below their waist and that all residents should wear shoes when walking in the town streets. Thomas S. Russo, Jr. Newton’s Town Manager said that this has been a topic of discussion among those involved with the town, including longtime business owner and recreation commission member Don Meng, who had owned the Craft Creators in the Art Alley. Meng was one who always supported the betterment of Spring Street and the Town of Newton overall, a legacy he left behind. “The genesis predates my tenure here,” Russo explained, noting that while he was at the Menlo Park Mall recently, there was an emphasis on the positive atmosphere at the facility, including decency standards. Sara Megletti, owner of the PB&J Stores was one of the members of the community who spoke up to advocate the idea of a family-friendly Newton, eschewing the idea of droopy pants and people walking around town with their shoes and shirts on. She took her cause to social media in addition to the microphone during the first and second public sessions. Sara Megletti of PB&J Stores speaks about the ordinance. Photo by Jennifer Jean Miller. Megletti said that the quality of life needs to be reclaimed in Newton and a family-friendly atmosphere established. She said while many of the comments that she hears in her store about the town from out-of-towners are positive, the negative perceptions seem to come from those more local to Newton, noting concerns about safety, appearances, building vacancies and other subjects about the downtown. 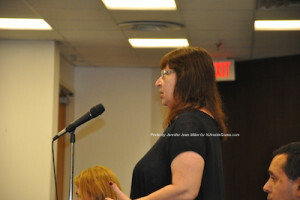 She suggested the council take a proactive approach with this and begin a campaign restoring community pride in Newton. “Newton has a public relations problem and it’s your opportunity to start a new reputation,” she told the council. 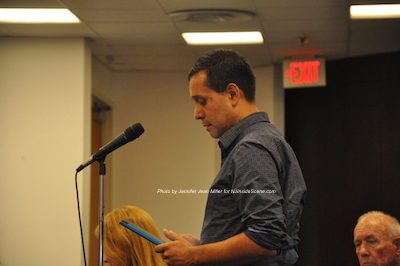 Xavier Izquierdo, who is another business owner but emphasized he was speaking as a resident. He disagreed with the idea of imposing the decency standards, indicating he does not condone attire like that for his own children, but said he has not seen a serious problem with it in town. He said he has never seen people walking barefoot and questioned if it is enough to make an ordinance into law. He said the council would be taking an “iron fist” approach, and that the town is small enough that the public would follow suit if addressed on the topic, without the need of an ordinance. Xavier Izquierdo, photo by Jennifer Jean Miller. Nanette Thomas was another resident against the idea. Nanette Thomas, a local resident, speaks about the ordinance. Photo by Jennifer Jean Miller. “It just doesn’t sound enforceable,” she said, adding that next people could be questioned about their haircuts or t-shirts they were wearing. She felt it could open the town up to litigation. She told the council a greater concern than dress code should be the loss of businesses downtown, the difficulties with some of the landlords and asked them to look at Denville as an example. Izquierdo followed up with comments that he thought that the council would face severe backlash. While the council overall has embraced the idea, Deputy Mayor Dan Flynn held off on sharing his opinion on the topic at this time. Councilman Wayne Levante suggested the council look to see if there was any litigation as a result of decency standards imposed in other municipalities. 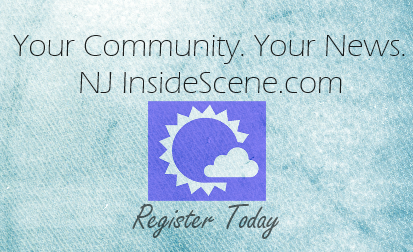 Some communities have enacted ordinances successfully in shore towns. “It’s not a major imposition to ask, especially on Spring Street,” said councilwoman Sandra Diglio, stating people should be required to wear shirts and shoes. In the second public session both Izquierdo and Thomas reemphasized their lack of support of the proposed decency standards. Megletti summed it up that some female customers come to her stating they do not like to come to Newton to shop, because of the way that people on the street are conducting themselves, including with their dress. 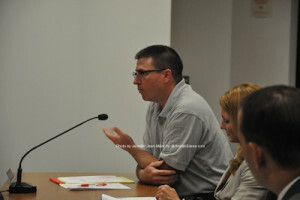 Megletti said the standards must be raised and that the town needs to make a change. “Were not trying to legislate style, but decent public behavior is what we ask for,” she said. For those who are severe offenders, there could be a summons and fine of up to $200 for multiple offenses, as well as community service. Hand in hand with the discussion on decency, Newton Police Chief Michael Richards tied in the other half of the public street ordinance pertaining to safety, with Officer Don Donofrio noting while downtown there should be an ordinance mandating that doors to apartment buildings not be propped open, for the safety of the building residents, in order to protect residents from theft and to keep their homes more secure. Police Chief Michael Richards speaks about proposed safety ordinances and the decency standards. Photo by Jennifer Jean Miller. The ordinances to approve Spring Street for one-way traffic, as well as the improvements for Trinity Street were both approved. The Spring Street ordinance had one dissenting vote from Diglio and the Trinity Street ordinance was unanimously approved. There were two ordinance drafts up for discussion. 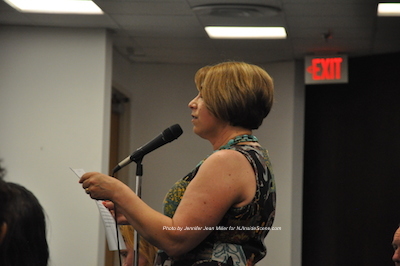 One was the fence ordinance led by town planner Jessica Caldwell. Caldwell said that there were provisions including regulating fences so that they do not dam the flow of water, that they are placed a foot off of the property line, and that they are not attached to a neighbor’s fence. Angelo Bolcato discussed the draft for the housing ordinance, which involves the health department. The health department may be able to intervene in situations where single family and multiple family homes may be unhealthy to reside in. 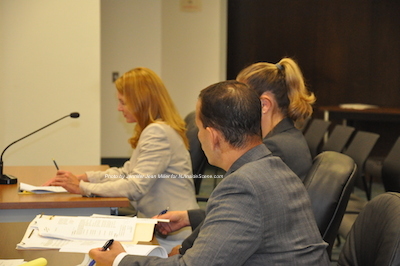 Angelo Bolcato, Ursula Leo and Jessica Caldwell speak about the ordinances. Photo by Jennifer Jean Miller. 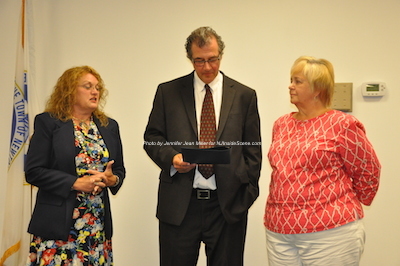 Sandra Diglio (left) and Kevin Elvidge (center) present Nancy Woods with recognition as Senior Citizen of the Year. Photo by Jennifer Jean Miller. 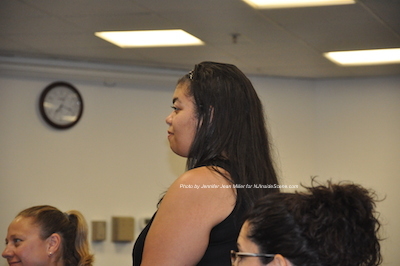 Michelle Estremera was introduced at the meeting as a new hire in the clerk’s office as a secretary. She has been a Newton resident for nine years and said she is excited to be a part of the team. Michelle Estremera introduced at the council. Photo by Jennifer Jean Miller. Little Miss Newton Zariah Moore and Little Mr. Newton Rodolfo Romero were guests at the meeting and posed for pictures, receiving recognition about their achievements. Russo also recognized Miss Newton Amelia Macchietto, though Macchietto was not present. 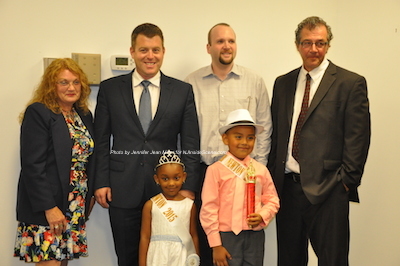 Little Miss Newton and Little Mr. Newton with council members. Photo by Jennifer Jean Miller. 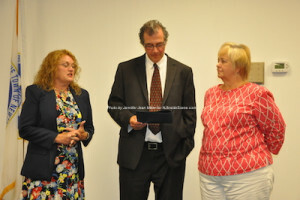 Members of the council thanked outgoing mayor Kevin Elvidge for his service. The reorganization for the Town of Newton Town Council will take place on Wed., July 1 at 6:00 p.m.